Happy masters of the grass. The middle of the Slam season is here and so far the year has given us some of the real good stuff! Score one for being happy and excited on a tennis court (Rafa and Venus), all-court mastery (Justine and Roger) and valiant efforts by media darlings (Davenport, Sharapova and, now, Andy Roddick). 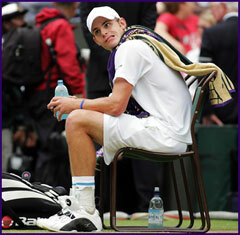 Roddick was gracious, humble and even strikingly funny in the face of defeat at Wimbledon. (Much better than that Saturday night Live appearance a couple of years back.) His media and match persona erased memories of his outburst versus an Italian journeyman during the first week of The Championships. After playing well, yet still being outclassed by Federer, Andy joked that he was in the "mood for a beer", and that the way to get to Federer would be to, "punch him, I don't know". Got us all laughing at the visual, but then you get the feeling Roger would dodge Andy's biggest and best blow, and artfully swivel around and throw Andy to the ground. Roddick: gracious, funny, outclassed, disappointed. What is so great about Roger Federer's game? What has gone on this season so far? What can we expect from the US Open series and the year's last Slam? Doubles. What's the deal there? By now you know I'm partial to it. I won't bore you with a paragraph on Roger Federer being the most wonderful player we've seen in years. The talent, the all-court game, etc, etc. We've seen it, and we've heard it from all of the commentators, scribes and senior tour stars. But what makes him so special? God-given talent, of course. Coaching by the likes of Peter Carter, Peter Lundgren and Tony Roche. 2 out of 3 are Aussies, so we know Roger comes by the attacking instincts honestly. Remember the name Robert Fulghum? He's the guy who wrote All I Really Need to know, I learned in Kindergarten. Well, let's just say that Roger is better at tennis 101 than anyone in the game. Roger's forehand: an evolved grip structure plus the ability to do everything and to stay within himself. To the delight of teaching pros everywhere, he watches the ball, he bends his knees and he moves his feet. Checking the tapes, we see that he ready-hops when his opponent hits with perfect timing, and he is able to do this more consistently than any other player. He has actually said in interviews that he is able to read his opponent's shots OFTEN. He senses a ball's direction and spin remarkably quickly, he takes off immediately with precise, unfluttered foot work, them immobilizes his opponent with the best disguise since Sampras. I'm talking about Federer, not SpiderMan (YES, I have a 3 year-old, and NO, there is no shortage of Spidey Swag right next to my office). Federer's head, as if on a gyroscope, gives nothing away, so his opponent is just a bit slower than he. When I watch other pro players trying to outgun Federer, it reminds me of a conversation I had with John Yandell years ago. We were comparing notes after separately having played against John McEnroe. Yandell described the experience this way "he seems to warp the space-time continuum." That resonated. It completely applies to the way Roger treats his opponents, especially on grass. There's our level, then a few more up there is Mac's. Then there is Andy's. And then there is Roger's. Could Mac alter the space time continuum? During Wimbledon, I wondered why incredible ball-strikers like Gonzalez, Kiefer, Ferrero and Roddick don't hammer away at Roger's sliced and poked returns. And why Roger is able to get into a rally, play amazing defensive, then suddenly turn it and blow the point open. I'm thinking that part of the answer is that the other guys do not enjoy low balls. And they can't really offend him with anything but line to line lasers. With Roger's more evolved grip structure, he can handle just about everything while actually playing within himself. Andy's self-effacing jab gave me the visual of Roger absorbing Andy's punch, and throwing him to the ground. It seems like there is some kind of martial arts element to his game. He is light on his feet when he reads and moves. Then he is able to morph into someone considerably heavier as he hits the ball. His flawless technique makes him as consistent as he is devastating. 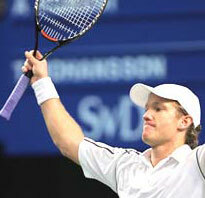 He laced 48 winners past Roddick in the Wimbledon final, while making only 12 unforced errors. The stat recalls the notion that if you're in the positives, you're playing a clean match. Well, then Roger played FOUR TIMES cleaner than the average match. The new Sisyphis of the modern game? You could forgive Andy for feeling like he's living out the Sisyphian role of Goran Ivanisevic to Pete Sampras. Right after a close straight-set loss to Pete in the Indy final of '96, Goran said something to the effect, "When you play Pete, you have to take all the chances - then you don't make them and you're home." I think Andy is just as funny in his own way, and just as realistic. Only thing is, Goran ended up taking 6 out of 18 meetings with Sampras. So far, Andy is 1 for 10. The limitations to Roger's game? Let's see, he's lost three times this year (twice to guys with birthday mojo), so the list must be short. Safin was hitting bigger than him in the Oz Open semi. And he was hitting the corners regularly. Gasquet went for broke, and topped Federer 7-6 in the third in Monte Carlo. Federer has already avenged both of those losses by beating them to the punch and by mixing in better passing shots. That's right, I said it: it looks as though Federer's passing shots have actually improved this year. Nadal the edge on Federer in biceps--and match wins. Loss number three was a different story, however. Rafael Nadal's got a 2-1 edge on Federer (they've split meetings at Key Biscayne the past two years and, of course Nadal bumped him unceremoniously in the semis of Roland Garros). Rafa's lefty toppers get the ball out of Roger's favorite range, and the discomfort shows. In the end, it was his forehand that sputtered, reminiscent of the great Sampras on that very same court in Paris. You get the feeling Roger brushes aside the competitive fire of a Hewitt or a Roddick, even Safin. Nadal can somehow make Roger think. Nadal doesn't give him a target, and is happy to play with the siege mentality, unlike the others who, against Federer, are damned if they attack and damned if they defend. On slower courts, it has become evident that Nadal runs a bit better than Federer, and therefore handles Federer's counter-attacking with more counter-attacking. That said, I believe if Federer finds the right alchemy of patience and confidence, he will someday beat Nadal on clay. Until then, their head-to-heads will be somewhere near even (gasp! ), depending on the surface and the conditions. Even Roger's sliced returns work to his advantage. I can't wait to go to the Open. Depending on how the entry system rankings play out over the US Open Series (and Safin's knee surgery), we could have Safin in a quarterfinal against Nadal, Hewitt, Federer or Roddick. Some mouthwatering semifinals, huh? The US Open doesn't get too many of its champions outside the top echelon, but there's the possibility of an unusual suspect like Coria, Gasquet, Thomas Johansson or Davydenko sneaking through to the second weekend. Nalbandian, Ferrero and Joachim Johansson have been there before, and I wouldn't be surprised if one of them threatens Roddick's or Hewitt's place in the final. However, I'm not as bullish on J. Johansson as I was last year. Davydenko, Johansson, Gasquet. Could one of them make the second weekend? Ancic and Melzer, I still believe in you two. It will depend on the speed of the court, and how well the bodies hold up after a grueling summer. Who'll be best prepared, with neither too much nor too little match play? What about the guys who spend four to six weeks on clay leading up to the Open, rather than sweating it out on the North American hardcourt swing? How will they handle the transition? Paging Mariano Puerta? New hope or future media victim? And speaking of stories. Have you heard the one about the Scottish kid who survived a school shooting, fell in love with tennis, trained in Spain and got a couple of sets off Nalbandian at Wimbledon? Andrew Murray casts an increasingly tall shadow in the fading light of British tennis. 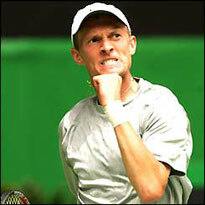 He's the new hope of the nation that gave us the rules of modern tennis. He's got the game to turn his countrymen from supercilious to superstitious again. If he ever wins The Championships, they'll wonder why Their Tim wore those German clothes instead of some good Fred Perry like that Murray lad. And if he never does? Well, we know what happens then. 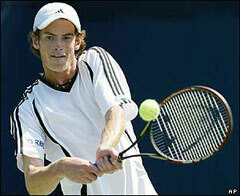 By the way, I don't know if this is good news or bad: Andy Murray looks to be an attacking clay court player. Venus: a surprising rediscovery of passion and joy. 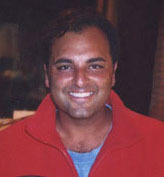 Indian Wells 1996. 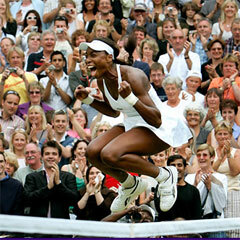 That's the last time I remember seeing Venus Williams competing with such passion AND joy. Maybe it was the chance to avenge her sister's loss to Jill Craybas at Wimbledon. Maybe it was the fact that she has kept fit, and she has finally recovered from her abdominal injury and knee problems. Her forehand and serve are really no better technically, but maybe what got her another Wimbledon is what got Justine Henin-Hardenne another Roland Garros - faith. Both suffered, worked hard and played with so much hunger and love for each point, it made me wonder if there isn't a little Nadal in all of us. There's a special desire in a veteran looking to stake her claim after some time outside of the winner's circle. Justine and Venus had it in spades. Davenport, not so much. Sharapova? She will be back. Mauresmo: I love Mauresmo. She's amazing. Just don't watch her when she's up a set and a break in the late rounds of a Slam. Her best results are next to Kuznetsova in the doubles draw. Davenport may just have to pull a Sampras this September. That's a ditto for Agassi, if he heals up. If he doesn't, there's a huge career waiting for him in broadcasting, coaching, and Genworth Financial spots. Beautiful until crunch time, but still beautiful. Hey Serena, what are you up to this summer? My hope is that you'll design a few haute-couture numbers, try them on and decide to get back in superhero shape. Train like a professional alongside Venus, and make a serious comeback as you learn to hit a proper slice backhand and first volley. You'll be winning Slams again soon. Let's face it. Doubles has been marginalized. From league tennis (a breaker in lieu of a third set), to men's college tennis (8 game pro sets, 3 of them counting for one point), all the way to the ATP (shorter sets, no-ad scoring and entry restrictions for players not in the singles draw starting in 2008). The proposed rule changes are very controversial, and they will be reviewed this September. Bob and Mike: more chest bumps than titles. The ATP is trying to right the doubles ship, and they deserve praise for acting toward the goal of making doubles more palatable to the singles stars -- a noble objective. There has got to be another way. The future Hall of Famer, Todd Woodbridge was going to retire anyway, but he made a pointed effort to bemoan the hastily-assembled nature of the ATP's doubles folly, "....and they're using a scoring system that doesn't even exist." I'm for the "let tennis be tennis" angle, but it just has not worked in doubles. There are some good ideas floating around: Trimming the schedule? The almighty Euro says, "Non. Nope." Televising it more and letting the public fall in love with it? Producing highlight reels of brilliant points on the doubles court, and playing it on the jumbo-tron between sets of singles? Too much effort just pushing singles in most markets. Easier to sell calendars. That said, there are some great stories floating around, too. And people love a story. The Bryan brothers sit atop the ATP doubles rankings. They cross like they're psychic. A few too many chest bumps for my taste, but the good far outweighs the bad. They win almost every match, except their first loss in Davis Cup to Ancic and Ljubici.... . and three Slam finals this year. You can bet they'll have something to prove in Queens this September. But how good are they really? 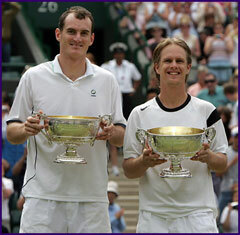 They lost the Wimbledon final to a couple of former US college tennis players named Moodie and Huss. Wesley Moodie, the very lanky South African played for Boise State, and his Aussie partner, Steve Huss played at Auburn during the same years. Prior to Wimbledon, Moodie and Huss had no ATP doubles ranking. Who are Wesley Moodie and Steve Huss--and why are they holding these trophies? BUT, here's a news flash that will change the whole deal. 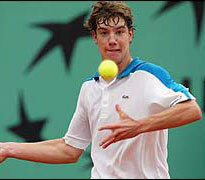 As of 2008, doubles entries will be taken from singles players with the exception of two wildcards teams. Basically, if you are not a TOP, TOP dubs team like the Bryan Brothers, it is going to be awfully hard to get into a draw. Hey, uh, journeyman doubles specialist? Meet Day Job. Day Job: meet Doubles Specialist. So, despite that depressing note for the doubles loving minority, I hope you all enjoy your tennis this summer. We are down in :Big D." (That's Dallas, Texas, if you didn't know.) Feel free to comment on this article (and others) in the Tennisplayer Forum. I'd love to hear from you.